Mushroom Garlic Walnut Pâté | Eat More Plants. I love, love, love mushrooms. I grew my own oyster mushrooms for a while and I’m going to start again. It’s a really fun project to do and it doesn’t take too much space. I bought a bunch of maitake, oyster and shiitake mushrooms and decided to make a yummy, decadent pâté with them. SO good. With everything really. Crackers, toast or veggies. 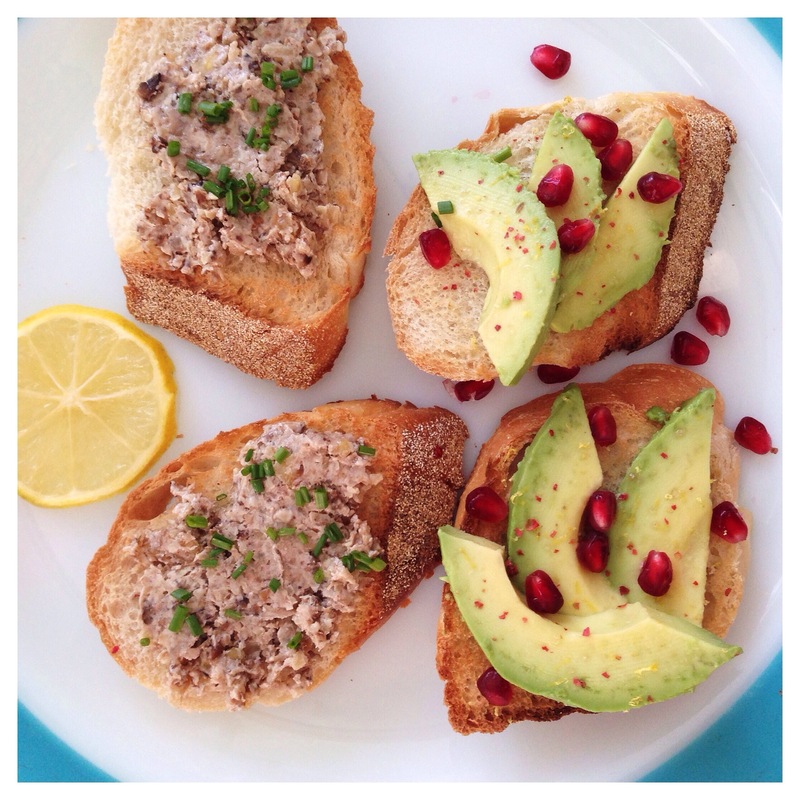 I spread my pâté on toasted semolina bread and then made it into a sandwich with avocado, pomegranate, chives and squeezed some extra meyer lemon juice and zest on it all. It might sound like a lot of flavors going on but it really works perfectly. Nothing outshines the main star, being the pâté, and everything compliments each other. Melt the first 3 T of butter in a sauce pan. Add mushrooms and sauté over medium heat for 5 minutes. Season with salt & pepper, add sherry, lemon juice & zest, garlic and the walnuts. Sauté for another 5 minutes, until liquid is evaporated. Let your mushroom mixture cool completely before heading to the next step! Add cooled mushroom mix to a food processor along with the other 5 T of butter. Process until uniform in texture; I like to leave mine a bit on the chunkier side instead of completely smooth. Scoop your pâté into a bowl and refrigerate for at least two hours before eating. This will help the mix to harden quite a bit. Serve with fresh chopped chives or parsley.